It’s been quiet here, for reasons which will be explained later, but in the meantime I should mention that CarbonCulture (with whom I’ve been working for the past two years as part of the TSB-supported EMPOWER collaboration) has a new blog. Continuing the meta-auto-behaviour-change effort started here, I’m publishing a few extracts from my PhD thesis as I write it up (mostly from the literature review, and before any rigorous editing) as blog posts over the next few months. The idea of how architecture can be used to influence behaviour was central to this blog when it started, and so it’s pleasing to revisit it, even if makes me realise how little I still know. In designing and constructing environments in which people live and work, architects and planners are necessarily involved in influencing human behaviour. While Sommer (1969, p.3) asserted that the architect “in his training and practice, learns to look at buildings without people in them,” it is clear that from, for example, Howard’s Garden Cities of To-morrow (1902), through Le Corbusier’s Ville Contemporaine and La Ville radieuse, to the Smithsons’ ‘Streets in the sky’, there has been a long-standing thread of recognition that the way people live their lives is directly linked to the designed environments in which they live. Whether the explicit intention to influence behaviour drives the design process–architectural determinism (Broady, 1966: see future blog post ‘POSIWID and determinism’)–or whether the behaviour consequences of design decisions are only revealed and considered as part of a post-occupancy evaluation (e.g. Zeisel, 2006) or by social scientists or psychologists studying the impact of a development, there are links between the design of the built environment and our behaviour, both individually and socially. The deadline’s fast approaching (mid-day 17th Dec) for the UK Technology Strategy Board‘s ‘User-centred design for energy efficiency in buildings’ competition [PDF] – there’s an introduction from Fionnuala Costello here. This is an exciting initiative which aims to bring together (in a 5-day ‘sandpit’) people from different disciplines and different sectors to address the problems of influencing user behaviour to improve the energy efficiency of offices and other non-domestic buildings, and generate commercially viable collaborative solutions to develop, some of which will then be part-funded by the TSB. 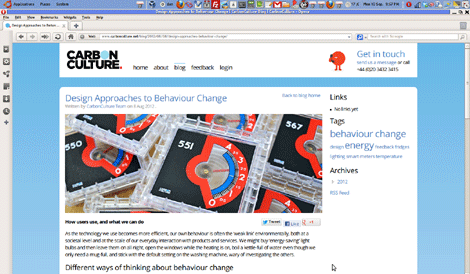 Fionnuala’s blog, People in Buildings has some great posts and discussions exploring aspects of how human factors and technology together might be used to help people use energy more effectively. If you or your organisation are interested in these kinds of issues – and using design to address them – it’d be well worth getting an application in over the next few days. 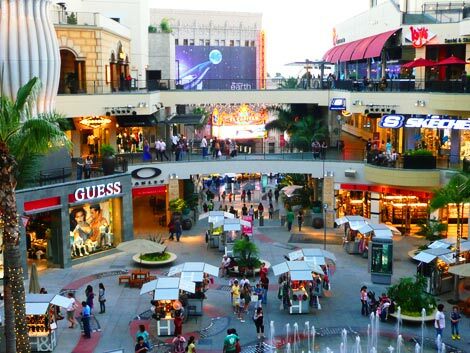 How much of designing an environment is consciously about influencing how people use it? And how much of that influence is down to users learning what the environment affords them, and acting accordingly? The first question’s central what this blog’s been about over the last four years (with ‘products’, ‘systems’, ‘interfaces’ and so on variously standing in for ‘environment’), but many of the examples I’ve used, from anti-sit features to bathrooms and cafÃ©s designed to speed up user throughput, only reveal the architect’s (presumed) behaviour-influencing intent in hindsight, i.e. by reviewing them and trying to understand, if it isn’t obvious, what the motivation is behind a particular design feature. While there are examples where the intent is explicitly acknowledged, such as crime prevention through environmental design, and traffic management, it can still cause surprise when a behaviour-influencing agenda is revealed. “The nature of the environmental designer’s problem is this: A behavioral system has been specified (within the constraints imposed by the particular human participants and by the goals of the organization of which they are members.) The participants are not presently emitting the specified behaviors, otherwise there would be no problem. It is necessary that they do emit these behaviors if their individual and collective goals are to be realized. The problem then is to bring about the acquisition or modification of behaviors towards the specified states (without in any way jeopardizing their general well-being in the process). Such a change in state we call learning. Designed environments are basically learning systems, arranged to bring about and maintain specified behavioral topologies. Viewed as such, stimulus organization becomes a more clearly directed task. The question then becomes not how can stimuli be arranged to stimulate, but how can stimuli be arranged to bring about a requisite state of behavioral affairs. Now, I think it’s probably rare nowadays for architects or designers to talk of design features as ‘stimuli’, even if they are intended to influence behaviour. Operant conditioning and B.F. Skinner’s behaviourism are less fashionable than they once were. But the “designed environments are learning systems” point Studer makes can well be applied beyond simply ‘reinforcing’ particular behaviours. Think how powerful social norms and even framing can be at influencing our behaviour in environments – the sober environment of a law court gives (most of) us a different range of perceived affordances to our own living room (social norms, mediated by architecture) – and that’s surely something we learn. Frank Lloyd Wright intentionally designed dark, narrow corridors leading to large, bright open rooms (e.g. in the Yamamura House) so that the contrast – and people’s experience – was heightened (framing, of a sort) – but this effect would probably be lessened by repeated exposure. It still influenced user behaviour though, even if only the first few times, but the memory of the effect that such a room had those first few times probably lasted a lifetime. Clearly, the process of forming a mental model about how to use a product, or how to behave in an environment, or how to behave socially, is about learning, and the design of the systems around us does educate us, in one way or another. Stewart Brand’s classic How Buildings Learn (watch the series too) perhaps suggests (among other insights) an extension of the concept: if, when we learn what our environment affords us, this no longer suits our needs, the best architecture may be that which we can adapt, rather than being constrained by the behavioural assumptions designed into our environments by history. I’m not an architect, though, or a planner, and – as I’ve mentioned a few times on the blog – it would be very interesting to know, from people who are: to what extent are notions of influencing behaviour taught as part of architectural training? This series of discussion board posts suggests that the issue is definitely there for architecture students, but is it framed as a conscious, positive process (e.g. “funnel pedestrians past the shops”), a reactionary one (e.g. “use pebbled paving to make it painful for hippies to congregate“), one of educating users through architectural features (as in Studer’s suggestion), or as something else entirely? Studer, R.G. ‘The Organization of Spatial Stimuli.’ In Pastalan, L.A. and Carson, D.H. (eds. ), Spatial Behavior of Older People. Ann Arbor: University of Michigan, 1970. What’s the deal with angled steps? It’s a simple question, really, to any readers with experience in urban planning and specifying architectural features: what is the reasoning behind positioning steps at an angle such as this set (left and below) leading down to the Queen’s Walk near London Bridge station? Obviously one reason is to connect two walkways that are offset slightly where there is no space to have a perpendicular set of steps, but are they ever used strategically? They’re much more difficult to run down or up than conventionally perpendicular steps, which would seem like it might help constrain escaping thieves, or make it less likely that people will be able to run from one walkway to another without slowing down and watching their step. Like the configuration of spiral staircases in mediaeval castles to favour a defender running down the steps anticlockwise, holding a sword in his right hand, over the attacker running up to meet him (e.g. as described here), the way that town marketplaces were often built with pinch points at each end to make it more difficult for animals (or thieves) to escape, or even the ‘enforced reverence’ effect of the very steep steps at Ta Keo in Cambodia, are angled steps and staircases ever specified deliberately with this intent? The first time I thought of this was confronting these steps (below) leading from the shopping centre next to Waverley Station in Edinburgh a couple of years ago: they seemed purpose-built to slow fleeing shoplifters, but I did consider that it might just be my tendency to see everything with a ‘Design with Intent’ bias – a kind of conspiracy bias, ascribing to design intent that which is perhaps more likely to be due to situational factors (a kind of fundamental attribution error for design), or inferring the intention behind a design by looking at its results! 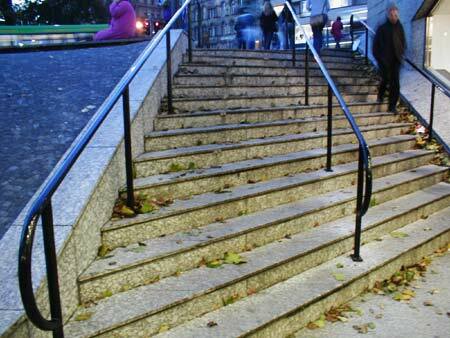 What’s your angle on the steps? 5.2.5 Staggered crossings on two-way roads should have a left handed stagger so that pedestrians on the central refuge are guided to face the approaching traffic stream. When I gave this example of Design with Intent at Lancaster, the discussion – led, I think, by Lucy Suchman and Patricia Clough – turned to how this arrangement inevitably formalised and reinforced the embedded hegemony of the motor car in society, and so on: that the motorist is privileged over the pedestrian and the pedestrian must submit by watching out for cars, rather than the other way around. Now, all that is arguably true – I had seen this example as merely a clever, sensible way to use design to influence user behaviour for safety, for everyone’s benefit (both pedestrians and drivers) without it costing any more than, say, a crossing staggered the opposite way round – but this is, maybe, the nature of this whole field of Design with Intent: lots of disciplines potentially have perspectives on it and what it means. What a traffic engineer or an ergonomist or a mistake-proofer sees as a safety measure, a sociologist may see as a designed-in power relation. What Microsoft saw as a tool for helping users was seen as patronising and annoying (at least by the most vociferous users). It’s all interesting, because it all broadens the number of interpretations and considerations applied to everything, and – if I’m honest – force me to think on more levels about every example. Multiple lenses are helpful to designers otherwise stuck at whatever focal length the client’s prescribed. Back to the crossings, though: the above crossing in Bath is a bit unusual in how it’s arranged with so many control panels for pedestrians. But in general, with simple Pelican and Puffin crossings in the UK, there is a design feature even more obvious, which only struck me* the same day I photographed the above crossing in Bath: the pedestrian signal control panel is usually also to the right of where pedestrians stand waiting to cross, i.e. 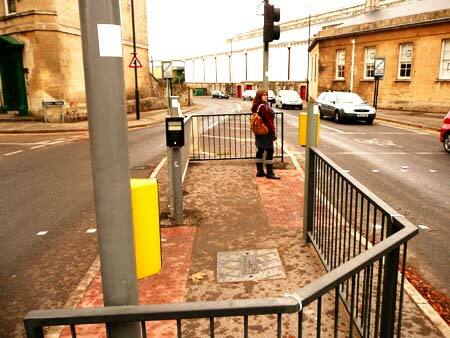 (with UK driving on the left), in order to press the button, pedestrians have to turn to face the oncoming traffic. The guidelines actually mention this as helping people with poor vision, but it would seem that it really assists all users, even if only slightly. It means you can watch the traffic as you decide whether or not you actually need to press the button, and will be more likely to be standing in a position where you can see the oncoming traffic at the point when you walk out into the road. 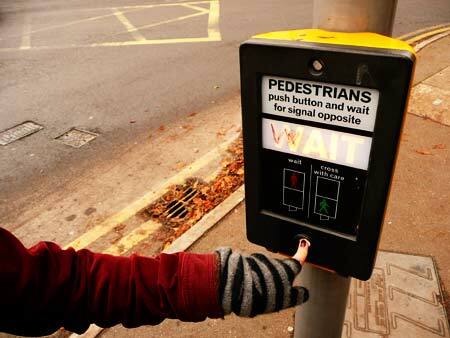 5.1.7 To assist blind and partially sighted pedestrians, as they approach the crossing, the primary push button/indicator panel should normally be located on the right hand side. The alignment should encourage them to face oncoming vehicles. 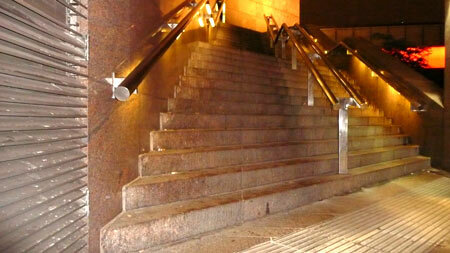 The centre of the push button should be between 1.0 and 1.1 metres above the footway level. 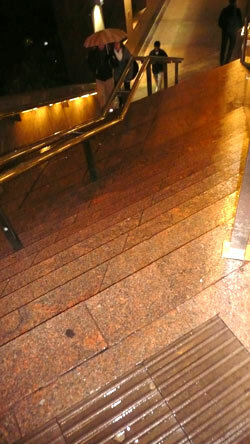 This is the sort of ‘hidden’ intentional, strategic design detailing which fascinates me. It is obvious, it is quotidian, but it’s also thoughtful. *Looking back through my notebooks, I see that someone actually mentioned this to me at a seminar at Sheffield Hallam in September 2007 but I forgot about it: many thanks to whoever it was, and I should be better at reading through my notes next time!